In response to ongoing questions from Wikipedia volunteers about Sue Gardner's $300,000+ compensation in the 2014 calendar year (see the Signpost's special report last month), Wikimedia Foundation board chair Patricio Lorente provided an additional explanation in an email to the Wikimedia-l mailing list, which shed some more light on the matter: it turns out that Sue Gardner was promised and received a $165,000 bonus to make her stay on until a successor could be found. This bonus, paid at the end of her tenure in 2014, accounted for more than half her compensation in the 2014 calendar year. We’ve heard your questions and want to address them broadly, as well as provide more information about the breakdown of Sue’s compensation during this time. We understand the confusion related to this recent 990, given the period it covers, and the aggregate amounts it reports. Below you’ll find additional information about the nature of our contract with Sue, the timeframe, and her work and compensation. I expect this will help resolve this conversation. As Chair, I am completely comfortable with all terms. Sue was a great ED and brought real value in exchange for her compensation. In re-reading Jan-Bart’s original email  where he stated that Sue was staying on as an advisor, it isn’t explicit that this was a paid position. We should have been more clear on this point. It is understandable that people wonder why Sue was not listed on the page of staff and contractors. However, everyone listed on the staff and contractors page report up to the ED. Sue did not report to the ED; she was accountable to the board chair. That's why she was not on that page. On the issue of compensation: We handled Sue's compensation the same way we do with other individuals: it is disclosed in the 990 as appropriate, and not elsewhere. That's our normal practice. This is true for a variety of reasons, including the fact that the results are certified through our external auditors. Other reasons include that it is a transparent mechanism, consistent with other large charitable organizations, and a matter of permanent, public record. The Foundation also wouldn’t normally announce the salary or contract compensation at the time of bringing someone on; that includes special advisors. We also don’t usually share the specific details of people’s compensation beyond what is published in the 990. However, the 990 can be confusing, especially when compensation levels change mid-year, and so in this case we (including Sue) are happy to clarify the specifics. One point of confusion is for the period this compensation covers. This is reasonable, this confused even some of us involved in preparing this response. Although the majority of activities reported on the Form 990 cover the Foundation’s fiscal year (specifically, the six months between July 1, 2014 - June 30, 2015), the IRS requires that details about compensation for certain highly-paid individuals are for the full calendar year in which the fiscal year begins or ends. So all the executive compensation reported is for twelve months, from January - December 2014, even though some of it it falls outside the fiscal year reporting (July 1, 2014 - June 30, 2015). Since Sue was on payroll during the 2014 calendar year, this means that the 990 contains her total compensation for the whole year, includes Executive Director salary, bonus, and special advisor work, at differing levels throughout that period. This number is Sue’s regular compensation as full-time Executive Director, before the appointment of the new ED. This is for the 2014 calendar year period of January 1 - May 31, 2014. It does not include compensation for any of her efforts following May 31, 2014. (2) Retention bonus to compensate Sue for lost opportunities during the transition period: $165,000. Sue informed us of her intent to step down in March of 2013, but agreed to stay on until a new ED was identified. In August 2013, the Board of Trustees approved a one-time retention bonus to compensate Sue for lost opportunities and for her willingness to remain with the Foundation during an important transitional period. Sue continued to serve as Executive Director for more than a year after announcing her resignation, even though she could have sought opportunities elsewhere. In addition to her other ED responsibilities during this time, she led the creation of a transition plan for the new Executive Director and supported the search process. The Board discussed this agreement with Sue over a few months before reaching the agreement in August. This is a standard practice used to compensate individuals for lost opportunities and ensure organizational stability during transitional periods. The Board and Sue agreed she would receive this retention bonus after the new ED had started. (3) Compensation as Special Advisor between June 1, 2014 - December 31, 2014: $29,167. Sue agreed to serve as Special Advisor to the Foundation for a term of one year after the new ED started, from June 1, 2014 - May 31, 2015. The Board felt that it was important to have Sue’s knowledge and experience at hand to support the Foundation as it went through an executive transition. In general, it is good practice to make sure that there is the ability to draw on the expertise of an experienced former executive: in this case, someone who grew the organization from a few people to more than 200. Sue’s total compensation for her role as Special Advisor was $50,000 per annum, $29,167 of which was reported during the 990 period. This is a small proportion of the total amount reported, as compared to compensation as ED and the retention bonus. In June of 2015, the Board of Trustees extended Sue's term as Special Advisor for another year, amounting to an additional $50,000. Her term ended May 31, 2016. The compensation for this period is unlikely to be reported in the next 990, as it is much lower than the threshold for reporting. However, Sue has agreed to disclose this total, given the interest in her role as Special Advisor. We realize this is complex, so to summarize: From January 1 2014 to May 31 2014 Sue was the ED and received her normal salary. When Sue left her position as ED we gave her a one-time bonus of $165,000, to compensate her for staying on during a long transition period. From June 1 2014 until December 31 2014 she received $29,167 intended to compensate her for advising the Board after the new ED started. These are the numbers reported in the 990. Since then, she received a total of $70,833 for work as a special advisor over a period of 17 months (January 1 2015 - May 31 2016). As Special Advisor, Sue reported to the Chair of the Board: first Jan-Bart, then myself. We did not ask Sue to produce a final report on her work as Special Advisor. Her contract did not require it, and we didn’t see any reason for her to create one. Sue was in regular contact with the ED, Chair, and Trustees throughout this period, and we are satisfied that the terms of the contract were met appropriately. Questions have also been raised about the number of hours spent by Sue during this period. The 990 reports that Sue worked 40 hours per week, which reflects her work while she was Executive Director. Forty hours per week is the standard, full-time employment threshold in the United States; most employers do not track the hours of salaried employees beyond these 40 hours. Sue often worked many more than 40 hours per week during her time as Executive Director. Once Sue transitioned into a consulting role, her hours varied. She consulted on an as-needed basis, sometimes as little as a few hours a month, sometimes many more. Sue’s special advisor status with the Foundation ended on May 31, 2016, and she is no longer on contract with the Foundation or receiving any compensation from it. However, many of the Trustees and Foundation staff continue to maintain close personal relationships with Sue. She played a critical role in developing the Foundation and the movement, and will always be welcome among us. We thank her again for her time and efforts on behalf of our mission, and we are grateful for her continued support and advocacy on our behalf. We would also like to thank Sue for her willingness to being completely transparent about her compensation here. Many people find this information sensitive. We appreciate that she has said she doesn't mind. I hope this answers more of your questions, and addresses any confusion. The further clarification provided was generally welcomed by contributors to the mailing list discussion. The Signpost also asked Patricio Lorente whether Lila Tretikov, who stepped down as executive director at the end of March 2016 after months of public controversy (see previous Signpost coverage), received a similar kind of bonus upon leaving and whether she is currently employed by the Wikimedia Foundation as a special advisor or in any other capacity. As I mentioned in my email to Wikimedia-l "Clarifications on 2014 Form 990," we disclose compensation in the 990 as appropriate, but we don't disclose it elsewhere or at other times. This is our normal practice, and recent leadership transitions will not change this. We will publish the 990s for 2015 and 2016, during which Lila was with the WMF on our normal schedule. They'll include the composition of all officers of the organization as appropriate, including the Executive Director. Lila is not currently employed by the WMF, as a special advisor, or in any other capacity. As things stand, further details on Lila Tretikov's compensation upon leaving will thus only be known when the 990 form for the 2016 calendar year will be published, probably around this time of the year in 2018. A NASA image of dwarf planet Pluto won the 2015 Picture of the Year contest. Picture of the Year: The Commons Picture of the Year 2015 results are in. See also the related op-ed in this week's Signpost issue. New user groups: The Affiliations Committee last month announced the approval of another Wikimedia movement affiliate, the Florida Librarians of Wikipedia. On June 1, the Wikiversity Journal User Group was approved as the latest addition to the Wikimedia affiliates family (see the special report in this week's Signpost issue for more on the Wikiversity Journal). Wikidata is looking for a community communications person: Wikidata are hiring for a Community Communication project manager (full-time, either based in Berlin or remote) to work as a liaison between the contributors, the developers, and other users. While the project manager will be employed by Wikimedia Germany, a knowledge of German is not required for the position. Freedom of panorama: Wikimedia UK comments on the current freedom of panorama debates, republishing an article by Wikipedian Owen Blacker. Wikiversity Journal was accepted as a user group of Wikimedia on June 1, 2016. This article therefore summarizes its activity and future prospects. Wikiversity Journal User Group allows contributions to the Wikimedia movement in a format that scholars are more accustomed to, academic publishing. Additionally the resulting articles are assigned standardized reference formats, making it easier for external scientific sources to build upon and cite Wikimedia works. What separates the Wikiversity Journal from the many other open access publications is that it offers both peer review and publication at no cost. The idea of launching a scientific journal as part of Wikimedia is not completely new. In 2009 a proposal for creating such a journal was made. Wikiversity Journal was officially started on March 25, 2014, with the creation of the Wikiversity Journal of Medicine main webpage. Three days later, Wikiversity Journal of Medicine was registered by the National Library of Sweden and assigned an International Standard Serial Number. Two weeks later, the journal became a member of CrossRef, which assigns Digital Object Identifier (DOI) codes to published articles, serving as permanent links from external sites. Before inclusion in the Wikiversity Journal of Medicine, articles need to have at least one peer review by a medical expert. The quality of the peer review is weighted when the editorial board makes the final decision on including an article in the journal. Readers can edit published articles after publication, but all edits are frequently monitored and disruptions have not occurred. The first editorial board of Wikiversity Journal of Medicine was formed in January 2015 and included among others Dr. Mikael Häggström, the journal's founder, and Dr James Heilman, former president of WikiProject Medicine Foundation and ex-member of the Wikimedia Foundation Board of Trustees. There are currently 16 articles published by the journal, including for example imaging of early embryos, an extensive medical gallery including cardiology, neurology, dermatology, biochemistry and endocrinology as well as an article on historical epidemiology by American doctor, epidemiologist, and author John S. Marr. The journal articles are indexed by Google Scholar. It is a future prospect of the journal to be indexed in MEDLINE/PubMed, a major database of scholarly literature. However, a greater number of articles are needed before the journal can become eligible for MEDLINE indexing, so there is still a lot of work to do. Wikiversity Journal User Group is intended to eventually include several journals, covering various fields of study. Coverage beyond the field of medicine came with the creation of a physics journal (created by Prof Guy Vandegrift). There are also ideas for Wikiversity Journal to become a separate Wikimedia project. After all, Wikiversity Journal is about making peer reviewed content freely available online, which is somewhat different in scope from Wikiversity which is primarily focused on teaching and learning. The main site for updates about Wikiversity Journal of Medicine is at Talk:Wikiversity Journal of Medicine, and the journal also has a Twitter page and a Facebook page for community interaction – please follow us to keep updated with developments – and contributions are most welcome. Having the journal accepted as a User group is one step forward for Wikiversity Journal, with still lots of work ahead. Publishing of additional articles in any of the journals. More articles will attract more readers, and eventually more contributors to the project. Outreach to potential article authors. For example, many scholars have written theses that are not published, but could very well fit as an article. Also, the project can be presented to students, such as participants in wikiedu.org. Students are often required to complete a research project as a part of their studies, and these journals provide them a potential means of getting their projects published. Review of existing publications. This does not require credentials in the subject, since an expert has reviewed the works before. Anyone may edit articles even after publication, but such edits are monitored daily. Translation of journal pages into other languages. Wikiversity currently exists in multiple languages (Čeština, Deutsch, Español, Français, Italiano, 한국어, Português, Slovenščina, Suomi, Svenska, Ελληνικά, Русский, العربية, 日本語), so availability of Wikiversity Journal User Group content in several of these platforms would increase usage and activity. 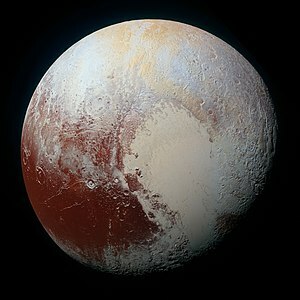 First place went to this high-resolution enhanced-colour view of Pluto taken by NASA on 14 July 2015; 658 out of 4019 people voted for this entrant. I could have written the usual, relatively uncritical Signpost coverage of the results of the Commons Picture of the Year competition in "News and notes" or as a "Special report", as we did here, here, and here, for example. But this year feels like the right time to take a look at a fundamental issue concerning the competition. Sixth place, NASA again. This composite image of the Pillars of Creation was captured by the Hubble Space Telescope in 2014 (noise reduction by Crisco). The structure is within the Milky Way, distant from us by about an eighth of the galaxy's radius. The pillars are an astounding five light-years tall. David Iliff's The Long Room of the Old Library at Trinity College Dublin—fourth place. I should say up-front that I'm neither photographer nor photographic critic; indeed, my last international trip amply showed a talent for turning great photographic opportunities into forgettables. However, I do have a passing acquaintance with the English Wikipedia's featured picture forum from the two years for which I wrote the Signpost's "Featured content" page. There I was first exposed to the expert opinions of our regular reviewers, and it was through reading their comments, as a weekly drop-in observer, that I could at least learn the basic criteria and even a few technical terms (alas, without impact on my flunky tourist photography). In highlighting featured promotions I also became aware of a fundamental difference between featured pictures and the other featured forums: articles, lists, and topics are solely the work of Wikimedians; in contrast, featured picture candidates are of three types: first, those that have been wholly created by a Wikimedian; second, existing images selected and improved—often very skilfully—by a Wikimedian; and third, existing images merely selected and uploaded without input except for categorisation and a short description note on Commons. Items in these categories involve strikingly different levels of skill and creativity by our people, but if promoted, they're given the same featured status regardless. I don't mind lumping images of these three types together in a single forum, whether on the English Wikipedia or on Commons, which has its own featured process: there, the throughput and number of active reviewers are just too small to fractionate them into categories. All the same, I must admit to a slight bias in my featured content Signpost coverage towards highlighting the work of Wikimedians over raw uploads from elsewhere. It seemed proper to give more oxygen to creative skill and originality in the community than to great images just grabbed from out there because they happen to be freely licensed. However, the double-round annual Picture of the Year competition—open to raw uploads of external images, apparently on equal footing—is huge by comparison, and affords much more opportunity to corral those three types of images so that the design and photographic skills of our community can be more fitly recognised. In round 1, 3678 people cast more than 175,000 votes for the 1322 candidates; in round 2, more than 4000 people cast 11,570 votes for 56 finalists (the top 30 overall and the top two in each category). While the competition does aim to encourage uploads to Commons, it seems odd to put all into the same bag, whether the fruits of the highly creative work of community members or merely upload grunt. In any event, this year NASA images won both first and sixth places: I'm sure NASA isn't even aware of these accolades, and probably wouldn't care either way. Are we squandering our social rewards? Kudos to all place-getters: there's some remarkable work here. However, allow me to bemoan the fact that the second round is not judged by a panel of experts after a democratic vote for the first round. In my view, the second-placed image belies the wealth of artistry in so much Islamic architecture: we're faced with half the image seriously underexposed almost to the point of black, the rest a bath of oversaturated colour without compositional depth. The design of the stained-glass windows does not appear to be worth highlighting—not to me, at least. With apologies to the photographer, I'm disappointed. To return to the theme of astronomy, the third place-getter, taken from an external site, is indeed striking technically and artistically in several respects, although the gendered and vaguely sexualised title was clearly not thought through ("Milky Way lying above a lady"). At least there's a human in the picture. David Illif's photograph of The Long Room at Trinity College Library gained fourth place and exemplifies this Wikimedian's prolific contribution to our repertory of article-ready pictures—and his talent for capturing grand interior perspectives. Fifth place went to an image of the Seljalandsfoss waterfall in Iceland, by Diego Delso, who will be well-known to Wikimedia's featured-picture communities. His work also won 11th place with an image of a basilica church in Colombia, in which ornate gothic revival protrudes from a richly structured craggy hillside. The seventh and eighth place-getters were taken from Flickr, and No. 12 was released by the British Ministry of Defence. No. 9 was of a pine-forest in Brazil just after dawn, by Heris Luiz Cordeiro Rocha. Here, light and shape combine to produce a serene, fog-streaked landscape. Tenth was Arild Vågen's picture of Rådhuset metro station in Stockholm, in which symmetry, straight lines, and reflection sit astonishingly within earthen walls and ceiling, challenging our preconceptions of railway stations as industrial forms. Andreas Kolbe's thought-provoking piece "Whither Wikidata?" sheds light on several troubling trends regarding the usage of Wikidata by third parties. Google and Microsoft, who secured well over half of Wikidata's initial funding, are now enjoying the fruits of our community's hard work with absolutely no strings attached. No considerations of public good. As Kolbe shows, Wikidata usage by these companies lacks attribution, and this means end-users don't know the provenance of the data they are served up, and the community loses potential new editors. We are also harmed in a third way: any modifications made by others to this rich dataset do not return to the community at large: as far as Google and Bing are concerned, Wikidata is very much there to exploit as "free" as in "free labor". Copyleft is the only assurance we editors have that our work will not be proprietarized (privatized, in plain English) down the line by third parties, who only truly care about free culture insofar as they can cash in on it, completely ignoring the spirit of sharing that is the cornerstone of our community. A solution for this problem would be to move to a copyleft license. The Open Database License (ODbL), for instance, was designed for datasets such as Wikidata, and has been used most notably on OpenStreetMap. ODbL's "ShareAlike" provisions (much like those of CC BY-SA) would be a tremendous step forward for our project, as it would ensure that Wikidata and its contributors are credited and that any derivations of this work will be released freely for all. We should not fear vain threats made by those who wish to use us as mere free labor for their enterprises. Wikidata's mission is not "to be the most used dataset in the industry". Its purpose goes way beyond that: we are translating knowledge into structured knowledge. We should not bend to the power of industry monopolists. No amount of venture capital or ill-disguised "donations"—really investments made with certain expectations in return—should interfere with our goal of making knowledge accessible. In this context, accessibility means "trickling down" freedoms; every downstream user needs to have the same guarantees we are granting upstream. Do you want to contribute to "In the media" by writing a story or even just an "in brief" item? Edit next week's edition in the Newsroom or contact the editor. This Signpost "Featured content" report covers material promoted from 29 May to 11 June. Text may be adapted from the respective articles and lists; see their page histories for attribution. Portrait of Maria Portinari depicts a woman dressed in the height of late fifteenth-century fashion, with a long black hennin with a transparent veil and an elaborate jewel studded necklace. Eusébio is S.L. Benfica's top goalscorer with 474 goals in 15 seasons. Grangelands and Pulpit Hill is one of the Sites of Special Scientific Interest in Buckinghamshire. Eleven featured articles were promoted these weeks. God of War (nominated by JDC808) is an action-adventure video game series loosely based on Greek mythology. Debuting in 2005, the series has become a flagship title for the PlayStation brand, consisting of seven games across multiple platforms with an eighth in development. The series' story centers around its playable character, Kratos, a Spartan warrior tricked into killing his wife and child by his former master, Ares. Kratos kills Ares at the behest of the goddess Athena and takes his place as the new God of War, but is still haunted by the nightmares of his past. Revealed to be a demigod and the son of Zeus, the King of the Olympian Gods, who betrays Kratos, the Spartan then seeks revenge against the gods for their machinations. What follows is a series of attempts to free himself from the influence of the gods and the Titans and exact revenge. Each game chapter forms part of a saga with vengeance as a central motif. Games in the series have been praised for being the best action games for the PlayStation brand, and some of the best action games of all time. Strong sales and support of the series led to the franchise's expansion into other media, such as a comic book series, two novels, and a web-based graphic novel. Michael Francis Egan (nominated by Coemgenus) (1761–1814) was an Irish American prelate of the Roman Catholic Church. Born in Ireland, he joined the Franciscan Order at a young age. He served as a priest in Rome, Ireland, and Pennsylvania and became known as a gifted preacher. In 1808, Egan was appointed the first Bishop of Philadelphia, holding that position until his death in 1814. Egan's tenure as bishop saw the construction of new churches and the expansion of the Catholic Church membership in his diocese, but much of his time was consumed by disputes with the lay trustees of his pro-cathedral in Philadelphia. The New York Yankees are an American professional baseball team based in the Bronx, New York, that competes in Major League Baseball. Their history (nominated by Giants2008) spans more than a century. Frank J. Farrell and William Stephen Devery bought the rights to an American League (AL) club in New York City after the 1902 season. The team, which became known as the Yankees in 1913, rarely contended for the AL championship before the acquisition of Babe Ruth after the 1919 season. With Ruth in the lineup, the Yankees won their first AL title in 1921, followed by their first World Series championship in 1923. Since then they have won the World Series championship twenty-six times again, with their most recent victory coming in 2009. The Good Terrorist (nominated by Bruce1ee) is a 1985 political novel by Doris Lessing. The story examines events in the life of Alice, a naïve and well-intentioned squatter, who moves in with a group of radicals in London, and is drawn into their terrorist activities. Three reviewers labelled the novel as a satire, while Lessing called it humorous. Some critics called the novel's title an oxymoron, stating that it highlights Alice's ambivalent nature, and that she is neither a good person, nor a good revolutionary. The Good Terrorist was shortlisted for the Booker Prize, and won the Mondello Prize and the WH Smith Literary Award. Portrait of Maria Portinari (nominated by Ceoil) is a small c. 1470–72 tempera and oil on wood painting by Hans Memling. It portrays Maria Maddalena Baroncelli, about whom very little is known. She is aged about 14 years old, and depicted shortly before her wedding to the Italian banker Tommaso Portinari. The panel is the right wing of a devotional and hinged triptych; the lost center panel is recorded in sixteenth-century inventories as Virgin and Child. Nights into Dreams... (nominated by Jaguar) is an action video game developed by Sonic Team and published by Sega for the Sega Saturn in 1996. The story follows two teenagers, Claris and Elliot, who enter a dream world called Nightopia where all dreams take place. With the help of Nights they begin a journey to stop the evil ruler Wizeman from destroying Nightopia and consequently the real world. It received positive reviews upon release; critics praised the graphics, gameplay, soundtrack, and atmosphere. It has been included on multiple lists as being the best Sega Saturn game of all time, as well as among the best games ever made. A direct sequel, Nights: Journey of Dreams, was released for the Wii in 2007. Borscht (nominated by Kpalion) is a tart soup popular in several East European cuisines. The variety most commonly associated with the name in English is of Ukrainian origin and includes beetroots as one of the main ingredients, which gives the dish a distinctive red color. It shares the name, however, with a wide selection of sour-tasting soups without beetroots, such as green borscht, white borscht, cabbage borscht, etc. Freida Pinto (nominated by Vensatry) (born 1984) is an Indian actress who has appeared mainly in American and British films. Pinto rose to prominence through the 2008 British drama Slumdog Millionaire, her first appearance in a film. She won the Breakthrough Performance Award at the Palm Springs International Film Festival and was nominated for various other awards. Her biggest commercial success came with the 2011 science fiction film Rise of the Planet of the Apes. Pinto received major attention for portraying the titular character Trishna and her performance in Desert Dancer received critical acclaim. The Dorset Ooser (nominated by Midnightblueowl) is a wooden head that featured in the nineteenth-century folk culture of Melbury Osmond, a village in the southwestern English county of Dorset. The head was hollow, thus perhaps serving as a mask, and included a humanoid face with horns, a beard, and a hinged jaw which allowed the mouth to open and close. Although sometimes used to scare people during practical jokes, its main recorded purpose was as part of a local variant of the charivari custom known as "skimity riding" or "rough music", in which it was used to humiliate those who were deemed to have behaved in an immoral manner. Hurricane Patricia (nominated by Cyclonebiskit) was the most intense tropical cyclone ever recorded in the Western Hemisphere and the second-most intense worldwide in terms of barometric pressure. It also featured the highest one-minute maximum sustained winds ever recorded in a tropical cyclone. Originating from a sprawling disturbance near the Gulf of Tehuantepec, Patricia was first classified a tropical depression. The system later became a tropical storm and was named Patricia. Exceptionally favorable environmental conditions fueled explosive intensification, and Patricia grew from a tropical storm to a Category 5 hurricane. The storm acquired maximum sustained winds of 205 mph (335 km/h) and a pressure of 879 mbar. Patricia's exceptional intensity prompted the retirement of its name in April 2016. Patricia made landfall in a significantly weakened state. Despite weakening greatly, it was the strongest landfalling hurricane on record along the Pacific coast of Mexico with winds estimated at 150 mph (240 km/h). Interaction with the mountainous terrain of Mexico induced dramatic weakening, faster than the storm had intensified. Within 24 hours of moving ashore, Patricia degraded into a tropical depression and dissipated soon thereafter. Nothomyrmecia (nominated by Burklemore1) is a rare genus of ants consisting of a single species, Nothomyrmecia macrops. It lives in South Australia, nesting in old-growth mallee and Eucalyptus woodlands. It measures 9.7–11 mm (0.38–0.43 in). Workers are monomorphic, showing little morphological differentiation among one another. Mature colonies are very small, with only 50 to 100 individuals in each nest. Workers are strictly nocturnal and are solitary foragers, collecting arthropod prey and sweet substances such as honeydew. Nine featured lists were promoted these weeks. Len Deighton (born 1929) is an English author. His bibliography (nominated by SchroCat) includes novels, works of military history, screenplays and cookery writing. He wrote his first novel in 1962, The IPCRESS File, and has written 26 further until 1996. Mad Max: Fury Road is a 2015 action film directed by George Miller. The film is set in a dystopian desert wasteland where gasoline and water are rare commodities. Tom Hardy stars as the title character Max Rockatansky, who helps rebel soldier Imperator Furiosa (Charlize Theron), rescue five women from the imprisonment of despotic leader Immortan Joe (Hugh Keays-Byrne). It grossed a worldwide total of over $378 million on a production budget of $150 million. Mad Max: Fury Road garnered awards and nominations (nominated by Cowlibob) in a variety of categories with particular praise for Miller's direction, its visual effects, costume design, editing, and Theron's performance. The film received ten nominations at the 88th Academy Awards, and went on to win the most awards at the ceremony with six. T-ara is a South Korean girl group, that debuted in 2009 after three years of training. Their discography (nominated by HĐ) includes four studio albums, seven extended plays, two compilation albums, two remix albums, thirty-six singles, and six promotional singles. S.L. Benfica is a Portuguese professional football team based in São Domingos de Benfica, Lisbon. Since their first competitive match in 1906, more than 750 players (nominated by Threeohsix) have appeared in first-team matches for the club, and almost 130 have made at least 100 appearances. Benfica's record appearance maker is Nené, who played 575 matches during his record 18-year career at the club; he is followed by António Veloso, with 538 appearances over 15 seasons. Manuel Bento is the oldest player to have played for Benfica. The 400-series highways (nominated by Floydian) are a network of controlled-access highways throughout the southern portion of the Canadian province of Ontario, forming a special subset of the provincial highway system. They are analogous to the Interstate Highway System in the United States or the Autoroute system of Quebec, but under provincial jurisdiction and regulated by the Ministry of Transportation of Ontario. Although Ontario had been constructing divided highways for two decades prior, 400-series designations were introduced in 1952. Initially only Highways 400, 401 and 402 were numbered; other designations followed in the subsequent decades. Buckinghamshire is a county in south-east England. It has an area of 1874 km², and a population of 739,600. As of April 2016, there are sixty-five Sites of Special Scientific Interest in Buckinghamshire (nominated by Dudley Miles). Fifty-five are listed for their biological, and ten for their geological interest. London Wildlife Trust (nominated by Dudley Miles and Chiswick Chap) is the local nature conservation charity for Greater London. It is one of 47 members of the Royal Society of Wildlife Trusts, each of which is a local nature conservation charity for its area. The trust aims to protect London's wildlife and wild spaces, and it manages over 40 nature reserves in Greater London. Spotlight is a 2015 American drama film directed by Tom McCarthy. The film follows The Boston Globe's "Spotlight" team and its investigation of sexual abuse in Boston. The film was a commercial success, grossing $88.3 million worldwide on a budget of $20 million. The film has been nominated for 138 awards, winning 71 (nominated by FrB.TG); its direction, screenplay and the performances of Mark Ruffalo and Rachel McAdams have received the most attention from award groups. It won the Academy Award for Best Picture and for Best Original Screenplay. Selena (1971–1995) was an American singer, songwriter, spokesperson, actress, and fashion designer. She has released (nominated by AJona1992) five studio albums, three live albums, three boxsets, two remix albums, one soundtrack album, and twenty compilation albums. Credited for elevating a music genre into the mainstream market, Selena remains the best-selling Tejano recording artist whose posthumous releases continue to outsell those of living musicians. Fourteen featured pictures were promoted these weeks. "Broke, baby sick, and car trouble!" Sports seemed to dominate the pop culture mishmash of the chart in the week of May 29 – June 4, 2016, with the death of Muhammad Ali leading the chart, basketball star Stephen Curry at #6, and two football topics UEFA Euro 2016 (#7) and Copa América Centenario (#9) also placing in the Top 10. But Game of Thrones also had two slots in the Top 10 as well, and probably will until their season finale. Sadly though, the mighty AFC Wimbledon who I have mentioned before, and who amazingly did get promoted to the English Football League One, still failed to get near the Top 25. But their day is coming, I just know it. For the full top-25 lists (and our archives back to January 2013), see WP:TOP25. See this section for an explanation of any exclusions. For a list of the most edited articles every week, see WP:MOSTEDITED. For the most popular articles that ORES models predict are low quality, see WP:POPULARLOWQUALITY. There was no question that the death of the iconic and unique American boxer would be a huge news story. He had been in very poor health more recently, and news reports in America that he was seriously ill quickly became news of his death. For purposes of this Report, the timing of his death did raise the question of whether it occurred too late to lead the chart (which runs from 0:00 UTC Sunday to 23:59 the following Saturday each week), but it did not. Almost all of 4.4 million views this article received occurred on June 4, the last reporting day of this Report. Hopes were high for this movie after the rapturous critical and commercial reception given to Bryan Singer's previous X-Men film, Days of Future Past; unfortunately the reviews for the followup have been largely negative, with the film struggling to reach a 60% "Fresh" rating on Rotten Tomatoes. Yet, this is its third week in the top 2 (it was #1 last week), and fourth week in the top 10. The latest season of this eternally popular TV series premiered on HBO on 24 April. And with last week's shock revelation, people turned to Wikipedia. With three episodes left in this season, we can expect it stay up on the chart. The last Monday in May (which was May 30 this year), the day that the United States chose to honour its war dead, is perhaps better known as the traditional beginning of US summer vacation, and is thus eagerly anticipated by millions of people too young to serve but old enough to stand in line for action movies. Curry's basketball team, the Golden State Warriors, are now in the 2016 NBA Finals. The quadrennial international football event kicks off in France on June 10. The annual list of deaths, always a fairly consistent visitor to this list, is often in the Top 10 this year. The views of this article are remarkably consistent on a day to day basis, with close to 100,000 views a day. Views went up slightly with the news of the death of Muhammad Ali (#1) on June 4, to 125,826 views for that day. When Prince died, views did substantially jump to 275K for one day (April 21). But substantial jumps like that are not driving the solid regular popularity of the article, which makes it a regular part of the Top 25. The 45th edition of the Copa América football tournament is being held in the United States this year, the first time the competition has been held outside its South America territory, and began on June 3. This horde of non-Americans crossing the southern border generated an Argentinian advertisement lampooning Donald Trump. A Google Doodle on June 2 celebrated the birth (in 1899) of German film director Lotte Reiniger, a pioneer in animation, and best known for silhouette animation. Her film The Adventures of Prince Achmed was released in 1926, over ten years before Snow White and the Seven Dwarfs. It's not uncommon for this list to become a parade of the dead; death is random, and often falls in quick succession. But as far as I remember, this is the first time the top three slots have been due to recent death. One, Muhammad Ali, the final end of a long, respected and bountiful life; another, Kimbo Slice, the result of the strange random happenstance that seems to be the Reaper's hallmark. And then there's Christina Grimmie, a death so infuriatingly senseless and cruel that calling it tragic is too forgiving. Outside these commemorations, our readers were mainly interested in traditional summer distractions: sports, movies and, of course, Game of Thrones. Float like a butterfly, sting like a bee. The hands can't hit what the eyes can't see. I’ve wrestled with alligators; I’ve tussled with a whale. I done handcuffed lightning and throw thunder in jail. My face is so pretty, you don't see a scar, which proves I'm the king of the ring by far. Folks, don't block the gate, don't close the door, for you may all go home after round four. To make America the greatest is my goal, so I beat the Russian and I beat the Pole. And for the U.S.A. won the medal of gold. The Greeks said, "You're better than the Cassius of old." OK, so he occasionally needed to work on his scansion. Note: If the numbers for the two days from last week are added in, the total is 9.74 million, which, in the Wikipedia Hall of the Dead, places Ali above Robin Williams but below Prince or David Bowie. The immensely popular boxer and mixed martial artist who got his start in true Millennial style by posting street fights on Youtube, died this week at the age of just 42. The immediate cause of his death was heart failure, though the ultimate cause is still unclear. Some things are difficult to talk about. It is a sad fact of American life that, just as people's lives can rise on a dime, so they can end. That a minor singing celebrity who had built her entire career on her relationship with her fans could be brought down by a single, random, misfiring member of her fandom who happened to have a gun is both tragic and infuriating. That it happened in Orlando, Florida now feels like a strange prelude. For the latest go round, held in France, the European international football tournament has been expanded from 16 to 24 teams, which means that most of the British Isles (bar Scotland) are competing together for the first time in decades. Of course, England's fans marked the occasion with a bit of hooliganism, as if the referendum weren't enough of a snub to Europe. The exhibition tournament between all ten members of CONMEBOL (the South American football federation) and six members of CONCACAF (the North American football federation) to celebrate 100 years of the South American international cup, the Copa America, kicked off on June 3. The latest season of this eternally popular TV series premiered on HBO on 24 April. With three episodes left in this season, we can expect it stay up on the chart. Fans of the supernatural may take some issue with the veracity of demonologist ghostbusters Ed and Lorraine Warren, but there's no denying that The Conjuring, the first film based on their case files, was a highly effective (and highly successful) spookfest. The sequel, which reunites stars Vera Farmiga (pictured) and Patrick Wilson, has proven just as popular, with a solid 75% on Rotten Tomatoes and $91 million worldwide grossed in just three days. The first person to observe and document over 8,000 bird species got a Google Doodle on her would-have-been 85th birthday on 9 June. Duncan "son of David Bowie" Jones's ode to the video game franchise he apparently loves has not wowed critics, with Rotten Tomatoes ranking it as the second-worst-reviewed film of the US summer season (the worst reviewed, if you're wondering, was the horror flick The Darkness, with just 5%, a score even Warcraft can look down on). Unsurprisingly, its domestic performance has been anaemic, coming in second to The Conjuring 2; its international performance, particularly in China, has, however, been fairly stellar, so Jones may come out of this with his well-earned good reputation intact. This week, the basketball player for the Golden State Warriors and current MVP weathered some fierce criticism on social media for some ill-advised sneakers and three below-par games in a row, but appears to have bounced back in his latest game against the Cleveland Cavaliers. The following content has been republished from the Wikimedia Blog. Any views expressed in this piece are not necessarily shared by the Signpost; responses and critical commentary are invited in the comments. For more information on this partnership, see our content guidelines. Poetry: “it is the stuff of the soul; it speaks to the body, the mind, and the spirit alike.” Sonja Bohm worked for years to get all of Florence Earle Coates’ poetry online, and now proofreads poetry on the English Wikisource, the free library. We asked why. Three decades ago, in a buy-sell-trade bookshop in Plattsburgh, New York, I came across a two-volume set of collected Poems published in 1916. Unfamiliar with the poet but intrigued by a platinum print photograph of a woman pasted inside the front board of volume one (above), I purchased the set for $2.50 and went home. For nearly two decades I wondered over the identity of the woman, and came to find—through an internet search—that it was the poet herself, Florence Earle Coates. Mystery solved. But I would not be satisfied with this knowledge alone. It was merely the beginning of a dedicated search into the life and times of a woman who had become my muse. Scant information was initially available on the poet. It appeared that her thoughtful, finely crafted works of poetry were important in her day—in her circles—but perhaps had not survived a supposed “renascence of poetry” or test of time. I resolved to remedy this by bringing her works back to life, but was at a loss as to how to do so until one of my children informed me that they had “edited” the Dr. Pepper article at Wikipedia. This planted a seed which would germinate a couple years later in 2009, when I created Mrs. Coates’ article at Wikipedia and author page at Wikisource—gradually adding all of her volumes of poetry over the span of about two years. But my activity did not stop there. To quote another contributor, “the power and potential of [Wikisource] is mind-blowing”: where one work refers to another (via wikilinking), thereby contributing to the “great conversation.” One author, one book leads to another author, another book—another idea. Seeing a work to its completion is a satisfying thing, but the process is perhaps even more rewarding. Word by word, line by line, page by page, proofreading is an active and learning process, as no two works are formatted alike. When necessary, there is no shortage of help from other contributors. Each offers different abilities, gifts and perspectives to the site, and I find most are eager and willing to share their unique insights and skills. You get out of proofreading what you put into it. Coates writes, “Great symphonies require more than one hearing; great poems more than one reading.” It is beneficial to first proofread and then re-read, thus ensuring the accuracy of editing, if not the cultivation of the mind. I use this passage to illustrate how proofreading such poetry, for me, is much like walking in step to the cadence of the panting of a faithful dog—it can be a very relaxing bit of mental exercise; but a word of warning: one must be careful to maintain focus and not become overly transfixed by the rhythmic pattern or fall into reverie too often during proofreading otherwise OCR errors and typos will be overlooked! I owe much to the works of Mrs. Coates, for her poetry sings of hope and joy, beauty and the ideal. But I am also thankful to Wikisource and its welcoming community for providing a space to showcase her poetry—and to my family, who has tolerated this editing hobby of mine. I received the following after posting some of Mrs. Coates’ poetry (on loss, grief and immortality) to another website: “Thanks for sharing these poems. I love her perspective on the human condition. I’d never heard of Coates before, but I’ll never forget her now.” My reply to the gentleman included a line from Coates’ “Deathless Death,” which states “no good, once given, can be lost.” I shared the same words a few years back with a woman whose son had died. She spoke of her son’s goodness, and the life-affirming words came to mind. “Why I ...” is a new ongoing series for the Wikimedia Blog. We want to hear what motivates you to contribute to Wikimedia sites: send us an email at blogteam[at]wikimedia[dot]org if you know of someone who wants to share their story about what gets them to write articles, take photographs, proofread transcriptions, and beyond. ^ Florence Earle Coates wrote a poem about Wordsworth entitled “Breathless We Strive.”. If articles have been updated, you may need to refresh the single-page edition. The Signpost is written by editors like you — join in!